For every substitute teacher, the moment arrives when you realize you have a classroom of students looking at you with expectation, and you have no plan. Don't panic. 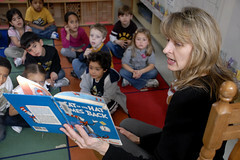 Whether you're with kindergartners or teenagers, all students love being read to! The high-schoolers may roll their eyes or put their heads down, but they will enjoy it even if they won't admit it. Keep some books in your work bag so that when the moment strikes, you have your own emergency sub plans. A well-stocked classroom library is one of the best things about an elementary classroom. Even without your own books, most teachers have many to choose from. For a change of pace, keep a few funny poetry books by Shel Silverstein or Jack Prelutsky handy. Older elementary students love the interactive style of "Choose Your Own Adventure" books. Still have time left? Simply challenge young students to draw a picture related to the story, or rewrite the story with an alternate ending. In the upper grades, reading may be more of a challenge due to time issues. Students are only in the classroom for a certain period of time, so you will need to assess what you have and plan accordingly. An anthology of engaging short stories is a good resource to keep with you as you can start and finish an entire tale before students move on to their next class. Students may groan at the mention of poetry, but find an entertaining collection and you will discover they will listen and enjoy it. Want to encourage teens to read more in their free time? Bring in some newly published books for young adults (the library is a great resource) and read them the first chapter. This little teaser may be just the thing to inspire older students to read for pleasure on their own. As a substitute teacher you will always be prepared with a few books in your bag. When you have too much time or the regular teacher doesn't leave work, a book is the perfect answer.